Nimpkish Lake Provincial Park, located south of Port McNeill on northern Vancouver Island offers a rugged wilderness experience in a remote setting. The park, situated at the south end of Nimpkish Lake, comprises the southernmost east-facing slopes of the Karmutzen mountain range and all of Tlakwa Creek drainage. 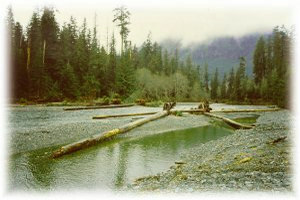 Nimpkish Lake Park protects old-growth coastal western hemlock forests in the Tlakwa Creek watershed, which features high ecological and wildlife values. Opportunities for nature appreciation, backcountry skiing, mountaineering and wilderness camping exist at this park, which is home to black-tailed deer and a variety of other wildlife. Nimpkish Lake Provincial Park is located at the south end of Nimpkish Lake, approximately 32 km south of Port McNeill. The easiest access to the park is by boat from Nimpkish Lake via the boat launch at Western Forest Products recreation site at Kim Creek, near the Nimpkish Service Station located halfway between Woss and Port McNeill on Highway 19. There are a number of logging roads which end near the park boundary and provide moderate to strenuous walk-in access. These roads are within Western Forest Products TFL 37 and include: Tlakwa Creek; Upper Tahsish River; Kilpala and Karmutzen Creek. It is recommended that visitors contact Western Forest Products in Woss for detailed information on these roads. The chance of encountering loaded logging trucks while traveling these roads is highly likely. Visitors should be very cautious. Cultural Heritage - Nimpkish Lake Provincial Park is located within the traditional territory of the Namgis First Nation. The park contains a portion of a First Nations traditional cross-island trade route known as the Grease Trail. Culturally modified red cedar trees (CMTs) can be found near the park boundary. Remnants of an old logging railroad exist in the park in the upper Tlakwa Valley. Conservation - Nimpkish Lake Provincial Park contributes to western very dry montane Coastal Western Hemlock variant in the Northern Island Mountains ecosection. The park contains mostly mature second-growth conifer forest (2,421 ha) including some Douglas-fir, Amabilis fir, Western hemlock and Yellow cedar. Making up the majority of the Tlakwa Creek watershed, the park protects provincially significant salmon spawning and wildlife habitat, including important winter range for black-tailed deer. Nimpkish Lake Park also contains karst topography. Approved Management Direction Statement [PDF] for Nimpkish Lake Provincial Park is available online in pdf format. Opportunities for kayaking and/or canoeing exist in Nimpkish Lake, which is outside of Nimpkish Lake Provincial Park. There are no developed trails at this park. Bicycle helmets are mandatory in British Columbia. Opportunities for fresh water fishing exist in the park in the Tlakwa Creek. Anglers can also fish in Nimpkish Lake, outside of the park. All anglers should check the current regulations issued by Fisheries and Oceans Canada prior to fishing. Anyone fishing or angling in British Columbia must have an appropriate licence. Portions of this park are open to hunting for specific species. Hunters must have valid licences and tags. Please refer to the current Hunting and Trapping Regulations and Synopsis publication for closures and regulations. Pets/domestic animals must be on a leash and under control at all times. You are responsible for their behaviour and must dispose of their excrement. Backcountry areas are not suitable for dogs or other pets due to wildlife issues and the potential for problems with bears. Opportunities for swimming exist in Nimpkish Lake, which is outside of Nimpkish Lake Provincial Park. There are no lifeguards on duty at provincial parks. Nimpkish Lake, which is located outside of Nimpkish Lake Provincial Park, is a popular spot for windsurfing. Most windsurfers access the lake from the Western Forest Products recreation site, via Hwy 19. This park offers opportunities for backcountry skiing/ski mountaineering in areas near Tlakwa Mtn. and Karmutzen Mtn. Both of these areas must be accessed via Western Forest Products logging roads. There are no designated campsites at this park, however random wilderness camping is allowed. No facilities are provided. Please practice “Leave No Trace” camping ethics.